Recent declines in monarch butterfly migrations and problems with honey bee populations, particularly colony collapse disorder, have raised awareness about the importance of these and other pollinators. One week each June is designated National Pollinator Week, and this year it is June 19-25. National Pollinator Week was initiated and is managed by the Pollinator Partnership, which promotes events around the country. During one of these events I will be presenting a visual program of 'Wildflowers and Pollinators' at Tomoka State Park in Ormond Beach on Sat. June 17. Here are just a few of the images and subjects that will be included in that program. Many pollinators visit wildflowers to feed on the nectar, and indirectly spread the pollen from flower to flower and assisting in the plant's reproductive cycle. Some insects actually feed on pollen, as in the case of the female Poecilognathus Bee Fly seen here in the photo above and the video below on Florida Scrub Roseling, a member of the Spiderwort family of plants that these bee imitators favor. Green metallic bees are very common in Florida and their opalescent green bodies can often be seen on and around many wildflowers. 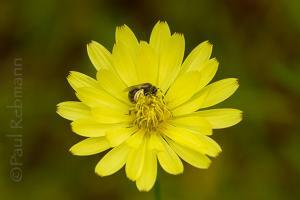 Here one is seen flying in front of some Coreopsis flowers, which are the official Florida state wildflower. Monarch butterflies make a remarkable multi-generational migration from much of the United States and southern Canada to Mexico and back. Some of these migrants pass through Florida, and some of those stay, particularly in South Florida to breed year-round. Monarchs require native milkweeds as host plants for the larval stage caterpillars, but the adults feed on the nectar of many wildlfowers. Above a monarch butterfly is seen on asters and below on another favorite of many pollinators, spotted beebalm, or horsemint. The palamedes swallowtail is another butterfly with some interesting relationships. The palamedes is a primary pollinator of the Pine Lily, also known as Catesby's Lily. The primary host plants of this butterfly are red bay and swamp bay, trees that are currently threatened by Laurel wilt, a deadly disease spread by the invasive redbay ambrosia beetle. There is concern that the massive bay die-offs as a result of Laurel Wilt will affect the palamedes butterfly populations, and in turn, pine lily reproduction. Thistle is another wildflower that is popular with many insects that serve as pollinators, as can be seen in these photographs. Above a palamedes swallowtail is seen on thistle with various other insects. Below a female black swallowtail butterfly feeds on purple thistle flowers with a gulf fritillary butterfly in the background and a pollen-laden blue metallic bee approaching. Another wildflower visited by many pollinators, and an excellent landscaping choice for people wanting to attract this kind of wildlife, is Bidens alba, commonly called beggarticks or Spanish needles. Here we see a couple of the Florida state butterflies – Zebra longwings – with a Bidens alba flower. For more images like these and links to more information on these wildflowers and pollinators, visit the pollinators page at Wild Florida Photo.